Annual competition awards a total of $6,000 to the three winners when they register in an institution of higher learning. 2014 winners Left to right: Madelyne Killelea, third place, Christian Mendoza, second place and Brianna Seratto, first place. The finalists present activities and programs they have personally done that implement one or more of the 21 precepts contained in “The Way to Happiness” book along with the JROTC Core Values in order to make the world a better place. 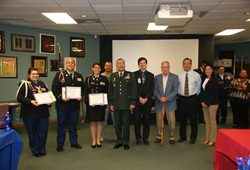 The finals of this year's annual JROTC "The Way to Happiness" Program and Scholarship Competition featuring area JROTC students will take place on April 16th at the offices of Harlingen Family Dentistry at Dixieland Rd. and W. Lincoln Av. in Harlingen. HFD has sponsored the event for the last eight years. The competition involves the finalists presenting activities and programs they have personally done that implement one or more of the 21 precepts contained in “The Way to Happiness” booklet along with the JROTC Core Values in order to make the world a better place. The three winners will share $6,000 in scholarships when they register in an institution of higher learning of their choice. This year’s finalists represent Harlingen High School and Harlingen High School South, Pharr-San Juan-Alamo Memorial, Veterans Memorial, Edinburgh North and Roma High School. All of the contestants are scheduled to continue their education and obtain degrees after high school. The finalists in the 2015 competition are Lucia Arellano, Tanya Cruz, Edith Flores, Stacey Morales, Alexia Reyes and Mayra Solis. Second place in 2014 was won by Christian Mendoza, also of Harlingen High School, who organized a new club on campus called “Cards Against Bullying” and turned his middle school bullying experiences into a positive initiative. The third place winner was Madelyne Killelea of McAllen High School who presented three project initiatives - “Help a Custodian,” “Park Clean-up” and a “Tree Planting Ceremony." Judges for the 2014 scholarship competition were led by Major General Charles G. Rodriguez, Ph.D., Vice President for Strategic Initiatives at Texas A & M University-San Antonio and a highly decorated veteran and former Adjutant General of the State of Texas. Major General Rodriguez also spoke to the cadets about the issues of leadership, education and the need for education and job skills in the Rio Grande area. To qualify, JROTC cadets are required to present a portfolio containing a JROTC Service Criteria resume, cover letter, certificates of achievement and references. Each candidate in the competition presents a portfolio summation of results achieved in implementing “The Way to Happiness” precepts and JROTC Core Values. At the competition, the finalists make an oral and visual presentation and project documentation. The first, second and third place winners are announced immediately after all presentations are completed by the judges.